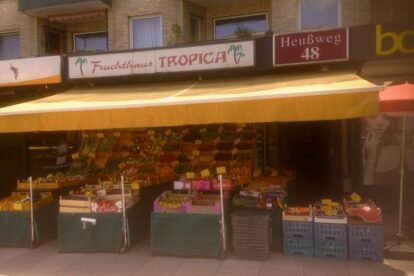 My favorite fruits and veggies shop is situated nearby the Osterstraße, at the heart of Eimsbüttel. Eimsbüttel is not in the city center but a quarter where young families live and enjoy the green places. And my favourite veggie dealer is in fact a small international grocery store. You get not just green, but yellow, purple, blue: everything in veggies and fruit. Plus: they are very reasonably priced. Don’t go hungry, otherwise you’ll do it like I do and buy all the other stuff they have there too: great olives, creams with and without garlic and Mediterranean bread. I like their basil cream a lot, and also love to dive in their home-made sigara börek, which is tasty cheese or cheese and spinach pastries which are fried. They are made in the shape of cigars, that’s where their name comes from. So no one leaves hungry, but with some nice food and accompanied by a smile from the owner instead. The best thing: around the corner is a small square with benches, so you could do a picnic there and watch people pass by or hang out by a nearby park.